Nathan is very excited because his freestanding basketball net is finally free of snow where we had it laid on its side in the backyard, so he can now get it out and start shooting hoops again. He scored the net for free last summer, just by being his normal friendly self. Nathan loves to make new friends, so whenever there's a new kid around he will always see if they want to play. Last summer there was a boy visiting his grandparents up the road and his grandfather dug out the old basketball net from when the boy's father was young. Nathan spent most of that week playing basketball with him. Then, one evening, he came home telling me that the boy was going home the next day and his dad said Nathan could have the net. Sure enough, when Paul went up to investigate, it turned out that the grandparents were moving and not taking the net with them, so they gave it to Nathan. After telling someone this story recently, I thought a lot about how Nathan got the net just by being his normal self. He wasn't trying to get a reward, but the reward came because of his friendly nature. Ephesians 2:10 says "He has created us anew in Christ Jesus, so we can do the good things he planned for us long ago." It is God's intention that His people do good in this world, not because we're looking for a reward, but because that is now who we are in Him. 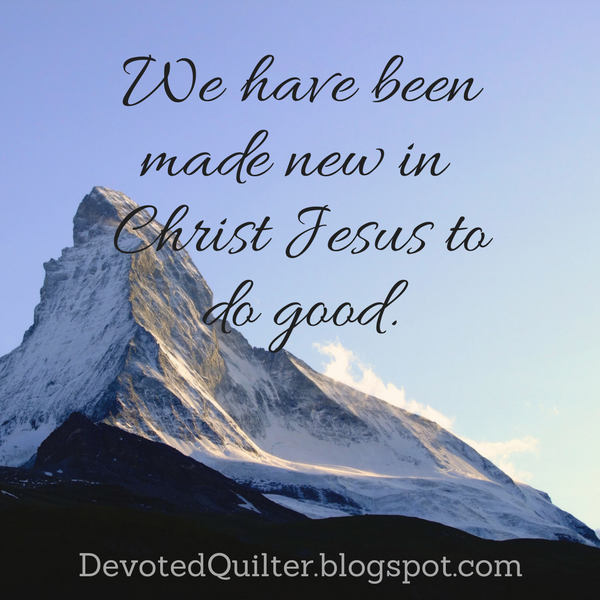 We have been made new in Christ Jesus, made to be like Him, and good should naturally flow out of that transformation. Paul also wrote, "So let’s not get tired of doing what is good. At just the right time we will reap a harvest of blessing if we don’t give up. Therefore, whenever we have the opportunity, we should do good to everyone—especially to those in the family of faith" (Galatians 6:9, 10). What this verse is really saying is that doing good, especially to other believers, should be our normal. Sometimes, though, we get tired of doing good because we don't see any result from it. We get tired of being nice to unfriendly or ungrateful people, or we get tired of always being the one to lend a hand when it seems like others can't be bothered to help. Paul is telling us to keep at it, that the reward will come in the end if we just keep doing the good things we've been called to do. I think the easiest way to keep doing the good things is to forget about the reward that will come. Just focus on finding joy in doing the good and leave the results of it out altogether. Be like Nathan, making a new friend just because that's what he loves to do, and then being pleasantly surprised with a gift in the end. Honestly, doing good things just to get a reward is a recipe for burnout, especially when those rewards are slow in coming. But if we find our reward in the act of doing good and in being more and more like Jesus, then we can keep at it, not getting tired or losing heart. And then any blessings or rewards that come our way will just be the icing on the cake.